You might think a baby crib is a simple purchase. You find one in the right color and size and you purchase it. Unfortunately, it’s not that easy. Purchasing a crib requires many decisions. Do you want a crib in your room? If not, will your baby sleep in the nursery in the crib? Do you want a crib you can convert into a toddler bed? These factors along with the size of your budget will help you choose the right crib. The crib should also contain the Juvenile Products Manufacturers Association seal of approval. This helps ensure you purchased the safest crib for your baby. Stability: You want a crib with a sturdy frame. You can test the sturdiness of a crib by giving it a “shake.” You can test the models set up in the store to see how they hold up. If the crib feels wobbly or you hear “rattling,” it may not be sturdy enough. You can also check for the presence of metal rods at each end of the crib. These stabilizer bars help keep the crib stable. Adjustability: If you want to get the most out of your investment, an adjustable crib is crucial. This feature allows you to raise or lower the mattress as necessary. Newborns can have the mattress at its highest setting. This makes it easier for new parents to reach in and out of the crib. As your baby gets stronger, though, you need to be able to lower the mattress. This prevents him from being able to climb out of the crib. Versatility: Consider the life you want to get out of the crib. Do you want a bed you can convert to a toddler bed? There are even options to convert it to a headboard/footboard for a full-sized bed. If you choose a convertible bed, read about the conversion ahead of time. Sometimes they require a separate conversion kit to complete it. This means a larger investment. Simplicity: Basic is always better. You can make the nursery as fancy as you want with other décor. The crib should focus on safety. If there are nooks and crannies your baby’s clothes could snag on, it can pose a strangulation risk. Keeping it simple is the best way to keep your baby safe. Size: You can purchase a full-sized crib or a mini crib. The full-size option stays stationary in one room. The mini crib measures smaller and may be portable. You can usually move them around the house quite easily. This crib gives any nursery a rich look. You can purchase it in cherry, black, espresso, gray, and white. It has the “clean lines” the CPSC recommends, but it still has a little “flair.” It also blends well with any type of décor. Tall and short parents often have a hard time finding the right crib. They need the perfect mattress settings for their comfort and their baby's safety. Sometimes taller parents struggle with even the highest mattress setting. 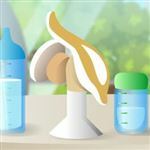 This is especially important for new moms recovering from childbirth. We found this Stork Craft crib to accommodate even the tallest parents. With three settings, once your baby can sit up, you can make the mattress lower. It is still easy to pick up your baby because he can sit up on his own. We also loved how easy the crib was to put together. Typical construction takes less than one hour. One word of caution, though. Make sure you set it up in the room you intend for it to stay. This is the case for most standard-sized cribs. They are too wide to fit through a standard doorway. Assembling it in your baby's nursery can sidestep this issue. This crib may require an additional purchase down the road. The full-sized bed rails do not come with the crib. You must buy the rails separately. This may contribute to the affordability of the crib. Planning for the additional investment in the crib down the road can help, though. Another purchase you might have to make after the fact is teething rails. If your baby becomes a “chewer," he may turn to the crib rails. This could damage the rails and his teeth. There are several options for you to cover the rails. On the plus side, this crib does not contain any toxic materials. You probably want to prevent your child from chewing on wood, though. Small spaces mean less room for a crib. The Dream On Me 4-in-1 Aden Convertible Mini Crib gives you both style and function. What it does not do is take up as much room as a full-sized crib. It looks like the fancier full-sized cribs at a fraction of their size and price. We love this mini crib because it also offers versatility. Down the road, you can convert it to a twin bed or daybed. This gives you even more return on your investment. Oftentimes mini cribs look portable. Either they are on wheels/casters or they fold up for easy transport. Not all parents want a mini crib with the portable appearance. This is another reason we love the Dream On Me Aden Mini Crib. Its aesthetic appeal can blend with any décor without looking “cheap.” It does not have wheels and it has a sophisticated look. We also love the durability of the crib. It is not made of cheap, particle board and it does not wobble or shake. You can also adjust the mattress in three positions. This helps to accommodate parents of any height while keeping your baby safe. As with most convertible cribs, you must purchase the twin bed rails separately. This adds to the cost of the crib down the road. If you wish to use it as a twin bed, allow enough time to find the right rails. You will likely want to purchase an additional mattress for this crib as well. The one it comes with is too flimsy. This makes it uncomfortable for any baby. Most people purchase a thicker mattress at the same time they purchase this crib. Because this is a mini crib, it does run small. This may mean your child outgrows it faster than you anticipated. The three mattress settings do allow for growth while keeping your baby safe. However, you may have to switch to a “big kid” bed sooner than you anticipated. Traveling with a baby requires what seems like unending gear. One major concern is where your baby will sleep. Safety and comfort are likely your most pressing concerns. The BABYBJORN Travel Crib Light gives you both along with convenience. 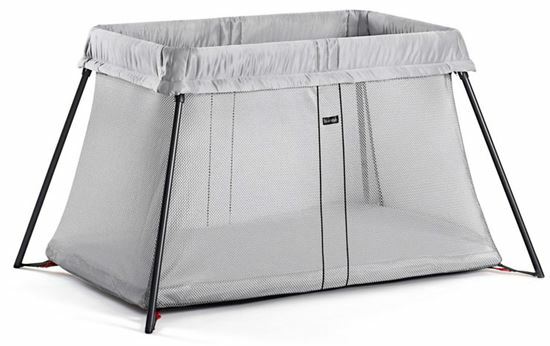 At only 13 pounds, most parents can easily transport this crib wherever they go. Whether you travel often or need a crib at grandma’s house, this crib does the job. The included carrying bag makes storing and carrying this crib a cinch. With only one piece to assemble, you can easily travel with this crib. You don’t have to worry about lost pieces or instructions. Once you unfold it and set the mattress, it is ready to lull your baby to sleep. Safety is always of utmost concern with babies and BABYBJORN met each concern effortlessly. This portable crib contains a solid base and breathable fabric. It also has attachments for the mattress to prevent suffocation or entrapment. As an added benefit, the crib fabric is machine washable. This can save you hard work and money down the road. Although this portable crib is safe for babies, BABYBJORN overlooked the tripping hazard of the legs. The legs jet out a good distance from the crib. Many parents claim this makes them trip if they are not careful. Another downside you may find is the height of the crib itself. It is set low to the ground. This may make it difficult to lie down or pick up a sleeping baby. This mainly pertains to very young infants who cannot sit or stand up on their own. For shorter parents, this portable crib may be best once your baby is strong enough to sit or stand. Having twins means twice the blessings and twice the baby gear. This means two cribs for most parents. There are double cribs available. However, most parents purchase two mini cribs due to space constraints. 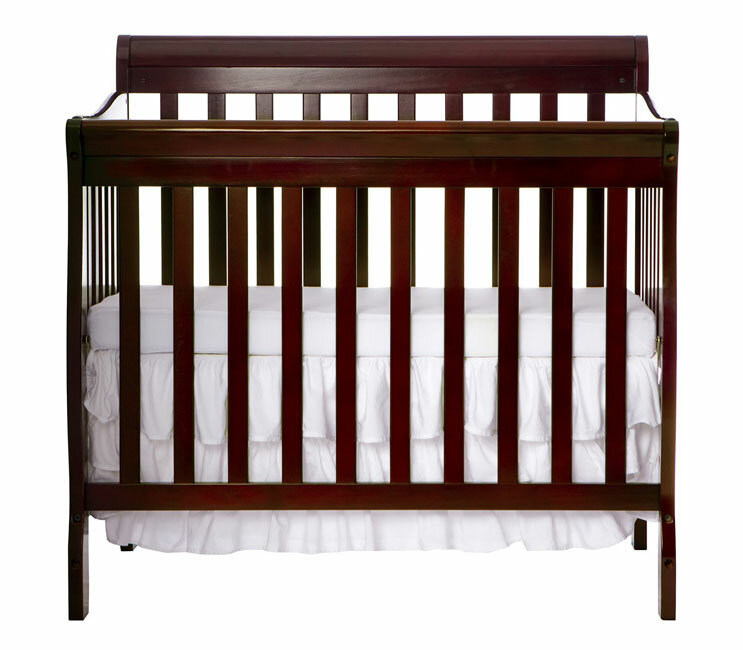 Double cribs are also often over-priced because they are a “novelty” item. The DaVinci Emily 2-in-1 Mini Crib is the perfect choice for twins because most parents can fit two in one room. This crib looks just as rich and elaborate as its full-sized counterparts, but it takes up much less room. You still get the adjustable mattress positions and sturdy construction. To further your investment, the crib comes with a toddler bed rail. It also converts to a twin bed, but you have to purchase the twin bed rail separately. As an added bonus, if you are on the shorter side, you can remove the decorative bar on the front of this crib. This makes it easier for you to reach your baby, especially on the lowest mattress setting. The pine wood construction of these cribs is beautiful, but it scratches easily. If your baby starts teething and using the crib rail as his teether, you may need to purchase teething rails. We also found the wood to easily scratch with regular use. This may reduce the life you get out of the furniture. Another downside we found is the difficulty in finding bedding sets for this crib. 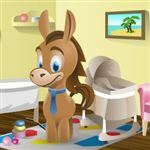 Many new parents create a theme for their baby’s nursery, complete with beautiful bedding. Unfortunately, manufacturers usually create bedding sets for full-sized cribs. However, this could work to your benefit. It could save you time and money down the road. With twins, you may not even have the time to make their beds every morning! Short moms have some definite challenges. One in particular is reaching their baby in the crib. Even though many cribs adjust, it is often not enough for short moms. The babyletto Hudson 3-in-1 Convertible Crib solves this problem. Because the crib is closer to the ground, short moms have an easier time reaching their newborn. To make it even easier to reach your baby, it has four mattress height adjustments. It also converts to a toddler bed or day bed down the road. This gives you maximum return on your investment. Your baby spends a lot of time in his crib. Not just as a newborn, but as he gets older too. With multiple naps a day along with nighttime sleeping, you want a quality crib that will last. Each crib we mentioned thus far meets U.S. safety standards. They also provide exceptional quality for the price. We defined quality cribs based on their materials as well as those you could use after your child outgrows the crib. A smaller nursery requires furniture with a smaller footprint. Enter the crib with a changing table attached. This is the perfect solution for those smaller rooms. You don’t have to sacrifice the changing table – you get one attached to the crib. 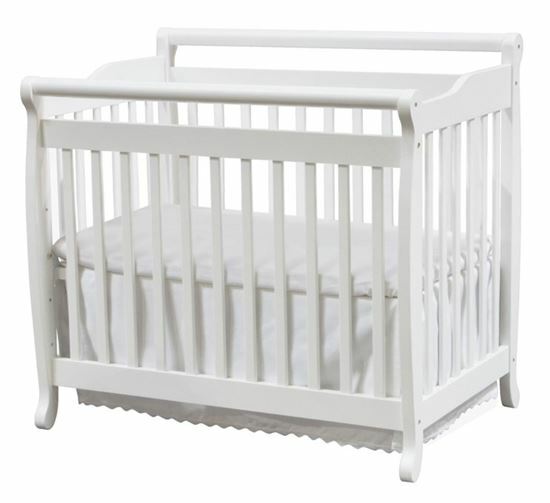 We love the Stork Craft Portofino 4-in-1 Fixed Side Convertible Crib and Changer. It has 3 mattress positions, converts to a toddler or youth bed, and includes a waterproof changing pad. It meets all safety standards and takes up only a little more room than a standard crib. A crib for grandma’s house helps make visits easier. New parents typically have to drag enough baby gear when they leave the house. Having a bed ready for your baby can really help. In addition, it gives your baby a familiar place to rest when visiting grandma. Whether grandma has limited space or just does not want a full-sized crib, the mini crib works well. 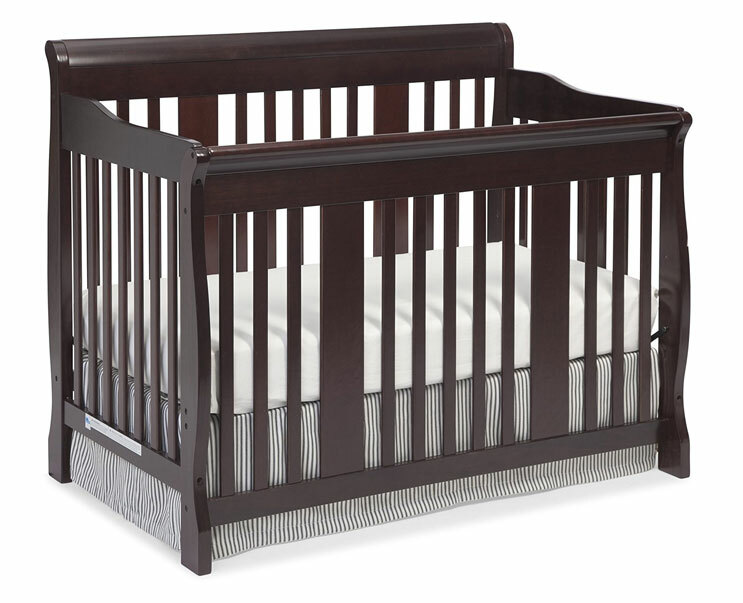 We love the Dream On Me 4-in-1 Aden Convertible Mini Crib for many reasons. It does not take up a lot of room and your child will have a bed to grow with him. This could make visits to grandmas even more fun. Quality does not always mean costly. 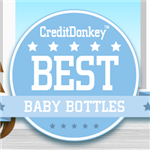 Our favorite crib picked for the best overall crib is under $200, if you can believe it. The Stork Craft Tuscany’s low price surprises many people because of its superior quality. We love it even more because of its ability to convert in the future. This means even fewer expenses for sleeping arrangements for your child down the road. Many parents state they used this furniture for several years with no issues despite its low price. If you want to stick to a budget of under $300 for your child’s crib, check out the Delta Canton 4-in-1 Convertible Crib. Made of solid hardwood, this bed also converts into a toddler or youth bed as your child grows. It has solid supports and the design is one that lasts for many years. Even if your child scratched it up, you could easily refinish the wood with minimal effort. This crib is available in 3 colors, each of which adds richness to any nursery décor. Finding the perfect crib for your baby is no easy task. Make sure to look at all aspects of the crib rather than its appearance alone. Consider long-term use along with specific features, such as height adjustments. Remember, your baby’s crib is one of the most important decisions you will make early in his life. Take your time and do your research. This way you and your baby will be happy with your purchase. Wayfair: Free Shipping on $49+ order. Leave a comment about The Best Cribs? Share on Facebook "Best Cribs"